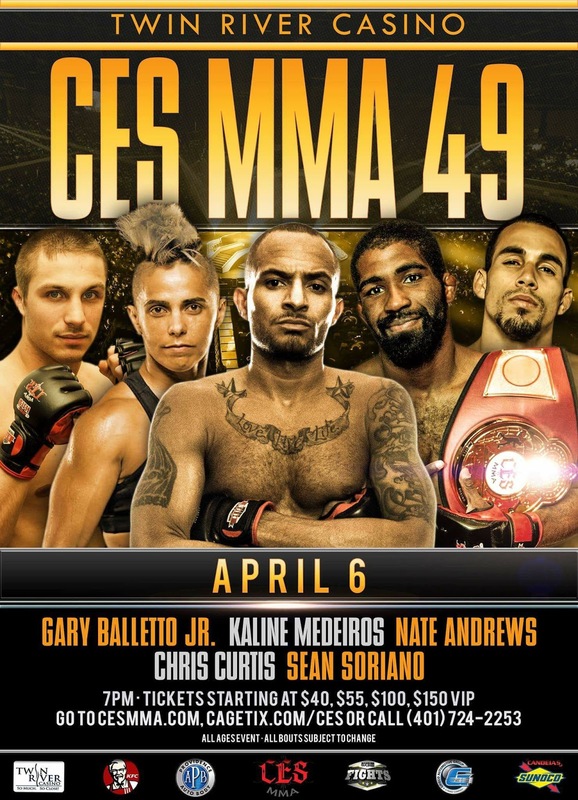 Fighters and Fans this article will update throughout the night giving those who cannot attend a live up to the minute recap of the events taking place live at Twin River Casino as CES MMA presents CES 49: Curtis vs. Norwood. This Blog will update between each round allowing you to stay close to the action without watching the fight. Keep in mind this is MMA and everyone views the action differently, I try to the best of my ability to give a fair unbiased overview of how the fight is playing out. If you do happen to be one of the fans watching live at the event or from home on AXS TV, please feel free to follow along with me as well to get another take on the action. Last fight: Unanimous decision victory over Nick Gulliver at NEF 31: The Old Port. Last fight: First round Submission of Trevor Gibbons at Gladius Fights 29. Last fight: Unanimous Decision victory over Tyler Hamilton at Bellator 194: Nelson vs. Mitrione 2. Last fight: Third round Submission (Choke) of Tim Ring at Triton Fights 5. Round 1: Fighters exchange early and Casey changes levels for a quick takedown, Casey lands from the top and then lets Ryan back to the feet where Castro eats a big right from Pat. Castro fires off some shots and they reset. Pat lands a left that stumbles Castro and Pat lands another takedown and works from top control. Pat again lets Ryan up and lands some fire before setting him back down again. Castro look frustrated in this round as Casey is getting the better of all exchanges. Ryan comes forward with an overhand and Pat clinches up. as the round ends. 10-9 Casey. Round 3: Castro comes out like a house on fire in round three looking to land from the Thai clinch, Pat returns a nice right hand and puts a stop to the output of Castro with yet another takedown. Pat eventually gains the back but Ryan manages to get back to half guard and eventually escape to his feet. Ryan goes for the clinch and puts Casey on the cage but is quickly reversed as Casey goes for another double leg. Ryan breaks the clinch with a nice overhand elbow but the pressure from Casey is too much and Pat gets another takedown. Casey holds top position for the remainder of the round. 10-9 Casey. Last fight: First round Submission (Choke) over Michael Taylor at CES 47: Rebello vs. Brown. Carlos “The Natural” Rodriguez Jr.
Last fight: Third round Submission loss to Danny Rodriguez at Aggressive Combat 17. Round 1: Fighters start out respecting each other and Carlos lands first once the strikes start to fly. Carlos clinches and puts Lugo's back on the cage . Lugo turns the action and has the pressure on Rodrigues now, looking for the single leg takedown, Lugo eats some shots before getting Rodriguez to the mat finally. Carlos scrambles but Jose holds on and gets the mount briefly before Carlos reverses position and stands up. Lugo gets the fight back to the mat where he once again has top position as the round ends. Close round 10-9 Rodriguez. Round 2: Rodriguez comes out throwing again and goes down in a ton of pain, looks like he planted to kick and blew out his knee. Carlos is on the ground riving in pain as John English calls a stop to the contest and medical staff engulf the cage. Decision: Jose Lugo defeats Carlos Rodriguez Jr. by TKO due to injury at :17 seconds of the second round. Last fight: First round Knockout of Mark Trader at CES 47: Rebello vs. Brown. Last fight: Knockout loss (Knee) to Steve McCabe at XFE Cage Wars in March of 2011. Round 1: Douma lands some jabs to start the fight then Burhans connects and grabs a guillotine and Douma slams him to the mat Douma struggles to stay in the fight but escapes before the submission can end his night. John gets back to the feet and grabs Burhans waist and drags him down to the mat. Burhans gets back up and lands some shots to the face of Douma. Douma answers back with a combination of his own as he look to clinch. Douma once again scoops Burhans off the mat and slams him to the mat again where he finishes the round on top. Close round 10-9 Douma on takedowns. Round 2: Douma connects first in round three, Burhans goes for as combination of his own and John goes for the clinch. Burhans wants none of the clinch and backs out and lands some shots of his own Douma gets the takedown and has Zach mounted and is landing some brutal ground and pound. Keith Peterson steps in as he has seen enough and stops the contest. Decision: John Douma defeats Zach Burhans via TKO ground and pound at 2:51 of the second round. Last fight: Second round TKO (Kicks) of Jacob Bohn at CES 44: Bessette vs. Trujillo. Last fight: Unanimous Decision loss to Takahiro Kawanaka at GRACHAN 34 x Brave Fight 16. Round 1: Soriano comes out kicking one to the head and one to the body, and another to the head, none land flush however. Soriano continues to display the kicking game and one finally lands on Gary's chin and sends him to the mat. Soriano jumps on top for the finish and Gary grabs Soriano's leg looking forf the Submission. Sean hops out and rolls to the back and sinks a deep Rear Naked Choke for the tap! Decision: Sean Soriano submits Jonathan Gary via Rear naked choke at 1:21 of the first round! Last fight: First round Knockout of Raymond Yanez at CES 46: Howard vs. Carroll. Last fight: First round Knockout loss to Keith Lee at KOP 59. Round 1: Marquis comes out with a leg kick as both men look for their range in the early going. Mack lands a leg kick of his own and follows with a kick to the mid section that Brewster catches and looks for the takedown. Mack stuffs the takedown and they return to the center. Mack comes forward and pushes Brewster up against the cage where he works some knees before Brewster backs out. Mack lands a left hand as Brewster comes in but Marquis lands some hands of his own that put Mack's back on the cage. Brewster goes for the takedown but Mack gets the trip and Brewster lands on top where the round ends. Another tough round to score. 10-9 Brewster. Round 2: Marquis comes out jabbing and Mack throws some hands of his own as the second round gets under way. Mack lands some nice strikes that back Brewster up and Mack shoots for the takedown but Brewster again lands in top position.Brewster is on top and working on the arm of Shawn Mack as he looks for the submission and possibly the mount. Marquis lands some short elbows from the top and is now looking to break the half guard of Mack. Marquis stands up and welcomes Mack to do the same but Mack stays grounded so Brewster returns to the mat once again in top position. Marquis ends the round dropping hammerfists to the face of Mack. 10-9 Brewster. Decision: Marquis Brewster defeats Shawn Mack by Unanimous Decision 29-28, 29-28, 29-27. Last fight: Third round Submission loss to Mackenzie Dern at Invicta FC 26: Maia vs. Niedźwiedź. Last fight: Unanimous decision loss to Paulina Granados at Combate Americas 9: Empire Rising. Round 1: Kaline comes out with two low leg kicks and then gets the quick takedown and ends up in half guard. Kaline is being active on the top landing some shots and keeping heavy pressure on Serio. Serio escapes and gets back to her feet where she looks to change the pace of the fight. Serio has a few strikes get through before Kaline pushes her to the mat, but Serios stands right back up. Kaline lands some strikes and Serio counters the shots with strikes of her own. Both girls are exchanging combos as the first round comes to a close. 10-9 Mederios. Round 2: Kaline comes forward as the opening bell in round two rings, Kaline mixes in a nice combo and sets up the takedown. Kaline waists little time on the ground and lets Serio return to her feet as Kaline starts to land more frequently now. Serio lands some glancing hands of her own before Kaline clinches and puts her against the fence. Fighters return to the center where its Serio looking to strike and some forward but Kaline is doing a great job of blocking and counter punching. Serio throws a kick that Mederios catches and uses to take Serio back down. Again Kaline stays on top briefly then lets Jenna back up. They clinch against the fence for a moment and both fighters circle out as the round ends. 10-9 Mederios. Round 3: Kaline ducks under an overhand by Jenna to open the final round as Serio establishes the center of the cage and backs Kaline into the fence. KAline initiates the clinch and takes Serio down once again. Kaline once again backs off and allows Serio to stand again before double legging her back to the mat. Again Kaline allows the fight to get back to the feet but not for long as Kaline gets it back to the mat. Serio is doing a great job not allowing Kaline to mount an offense from the top but that is not going to win her the fight. Kaline finally steps over into half guard as Serio turns her back. Kaline works to full mount as the final seconds tick off the clock. 10-9 Mederios. Decision: Kaline Mederios defeats Jenna Serio by Unanimous Decision 30-27 x 3. Last fight: Second round Submission (Choke) of Miguel Restrepo at CES 47: Bessette vs. Trujillo. Last fight: Third round Submission (Armlock) loss to Johnny Lopez at Reality Fighting. Round 1: Richie establishes the center of the cage early and looks for a high kick that misses. Matt connects on a a kick to Richie's kidneys and Richie crumbles to the mat and Almy follows up for the stoppage. The Kidney shot hurt Richie bad and he could not recover as Almy hops on top with the d'arce choke for the stoppage. Decision: Matt Almy defeats Richie Santiago via D'arce choke at 55 seconds of the first round. Last fight: Third round Submission (Choke) of Sharif Jones at CES 46: Howard vs. Carroll. Last fight: Split Decision Draw against Bassil Hafez at CFFC 68. Round 1: Wells comes out with a side kick but Gary establishes the center of the cage early. Wells comes forward wildly and puts Gary's back on the cage. Gary survives and gets met with a superman punch followed by two heavy shots including a right hand that drops Balletto and lands straight to the jaw and Gary goes down. Wells hops on top and lands fists to earn the stoppage. Decision: Jeremiah Wells Knocks out Gary Balletto Jr. at 57 seconds of the very first round. Last fight: First round Submission (Choke) of Tyler Combs at CES 47: Rebello vs. Brown. Last fight: First round Submission (Choke) loss to Gabriel Green at Bellator 192: Rampage vs. Sonnen. Round 1: Padilla comes across the cage quick and these dudes are brawling. Padilla lands and so does Andrews as both men look to finish his fight early. Andrews lands a knee and an overhand that get through clean. Padilla lands a takwdown and has top control. Padilla is landing heavy offense from the top as he looks to end this thing early. Nate gives up his back and Padilla looks for the choke finish, Padilla cant finish and Nate transitions to the back and looks for the finish. Padilla scrambles to the feet and ANdrews lands some elbows before getting the takedown but Padilla lands on top and once again looks to finish as the round ends. 10-9 Padilla. Round 2: Nate lands with the left hand to open the round and then lands some combinations that back Padilla into the fence. They go to the ground and Padilla is once again on top but Nate reverses and takes Padilla's back and sinks in the rear naked choke that almost ends Padilla but he escapes. Andrews regains the back and this time Padilla is in deep trouble as the choke ends the night and lands the Lightweight belt around the waist of Nate Andrews! Decision: Nate Andrews submits Chris Padilla by Rear Naked Choke at 2:04 of the second round. Nate Andrews is the NEW CES MMA Lightweight Champion of the World! Absolutely great fight! Last fight: Unanimous decision victory over Carlo Prater at Fury FC 19. Round 1: Norwood uses strikes to set up the clinch and has Curtis against the fence looking for a takedown. Curtis is doing a good job defending the takedown as Norwood continues to work. Chris rolls away from the clinch but Norwood does more of the same and uses strikes to set up a takedown. Norwood has Curtis down and against the cage a Chris continues to defend the advanceing Norwood. Curtis is doing a great job with the overhooks to keep Norwood close on the ground as Curtis stands but still has his back against the cage. Norwood takes some hamerfists as he tries to take Curtis down again. Both fighters land knees in the clinch and Curtis lands some nice body shots are the round ends. 10-9 Norwood. Round 2: Fighters trade jabs to open the second round as Curtis looks to keep this at distance. Curtis lands a nice uppercut that touches the jaw of Norwood, Curtis adds some nice jabs that land aswell as Norwood has had enough of the standup and goes for the takedown and once again has Chris against the fence. Curtis stands but is still in clinch position as Curtis looks for space to work his striking. Chris rolls out and is again at striking distance. Curtis lands a right hand that looks to have cut Norwood as he tries for a takedown and is stuffed. Curtis looks to be outlasting Norwood on the feet and this round ends standing! 10-9 Curtis. Round 3: Chris comes out in the third looking like the fresher fighter as he looks to chop Norwood down. Curtis lands a left that gets Norwoods attention and Norwood follows with a combo of his own. Norwood drops for a takedown but Curtis smells it coming and steps out of the way. Norwood connects with Curtis' cup and English briefly stops the action. Norwood is clearly bleeding heavily from his nose and wearing this fight on his face. Norwood tries a kick and it is caught by the Champ and Curtis makes him pay with straight shots to the face. Curtis is connecting on his short strikes and Norwood is eating most of the shots as the third round ends. 10-9 Curtis. Round 4: Jason opens up the championship rounds coming forward with strikes but Chirs is true fashion is counterstriking him very effectively. Norwood shoots for the single leg but cant get Curtis down. Norwood connects once again with the cup of Curtis and the action stops once again. Jason breaks the action wearing a ton of blood on his face now. John English takes a point from Norwood for the groin shot. The Action stops again as Norwood attacks the groin area once again. Chris comes back looking to make Norwood pay for the groin shots as he puts some nice striking together after the break. Chris is doing an amazing job working angles on the feet and landing some heavy heavy shots as the round ends. 10-8 Curtis. Round 5: Curtis smells blood as the fifth round gets underway, Norwood clinches again and goes for the takedown. Chris stuff the attempt and they end up standing on the cage. Chris again seperates and is at striking distance again as he lands a body shot. Chris continues to chop Norwood down as he is landing at a heavy pace now. Norwood clinches against the cage again with just a minute to work, Curtis is landing strikes from the clinch as they break. Chris stalks Norwood down over the last 10 seconds landing combinations as the fight ends. 10-9 Curtis. Decision: Chris Curtis defeats Jason Norwood by Unanimous Decision 49-45 50-44 48-46. To retain the CES WElterweight Title.